This will be a daily driver so I didn't want a permanent bed set up and I wanted as much versatility as possible. Will you ever need to seat more than three? If not I would consider a single seat behind the driver since it will give you walk around space and a much more open feel. If you are not putting a swivel on the passenger seat this might not be a big deal. If you only need to occasionally seat more than three they could sit in the back on the sideways benches. My kids did this for a long time and didn't mind a bit but some don't like that idea for safety reasons. I agree with 86Scotty above. One of the best things about vans is that you can go from the front to the back without having to get out. If a single or double captains chairs are an option, I would go with that. Something to consider with your layout is storage space. If you have your camping gear in plastic totes or other box type storage, think about where those are going to go when you go camping. Or even any other larger item. You mentioned you wanted as much versatility with your van since it will be a daily driver. With most interior buildouts, you limit cargo capacity with fixed furniture. This interior has been my favorite for maximum versatility. Its in a Ford van, but the concept can still work in the Sprinter. I bet you are overestimating your storage space. I was surprised how little storage space there ended up being under the seats once you fill them with a water tank, inverter, batteries, water pump and plumbing, furnace, water heater or whatever else you have in your build. With a low roof, you won't have any overhead storage. I would make a list of everything you need to travel with and figure out where it is going to go (bedding, clothes, food, dishes, towels, lawn chairs, grill, etc etc etc.). Great input, thanks for replying! We needed the bench seat to provide seating for 5 at times. We thought about the walkthrough issue but not really a way around it for us. Storage benches will be mostly for utilities. Clothes, food, etc we will just have to figure out as we go. Bad idea to "just figure it out as you go"! Try to design it in from the beginning, as much as possible. Trust me, it's no fun to always have to rearrange duffle bags, suitcases, or whatever each night. We regularly travel with three people in our van, and the clothes and stuff really add up, even when trying to travel light. Most folks who do the campervan thing also tend to have active vacations, so there are hiking boots, raincoats, and all that to consider (at least for us). If there is any way you can go with some sort of extended van (the medium length Sprinter) you will REALLY appreciate the extra internal real estate and won't mind driving the length so much once you get used to it. I have actually heard that from a lot of people who live in their van, travel with 4 kids, etc and their input has been "make sure you need it before you add it" and "simpler is better" so we're going that route vs overbuilding and having a van full of built-in furniture that we may or may not like. We can add as we go and come up with creative storage solutions along the way. L-tracks and panniers seem to work well as do hanging bags to get things out of the way. 170 wasn't an option, we want the penthouse top for a second sleeping area. That really drove us to the set up we are shooting for. 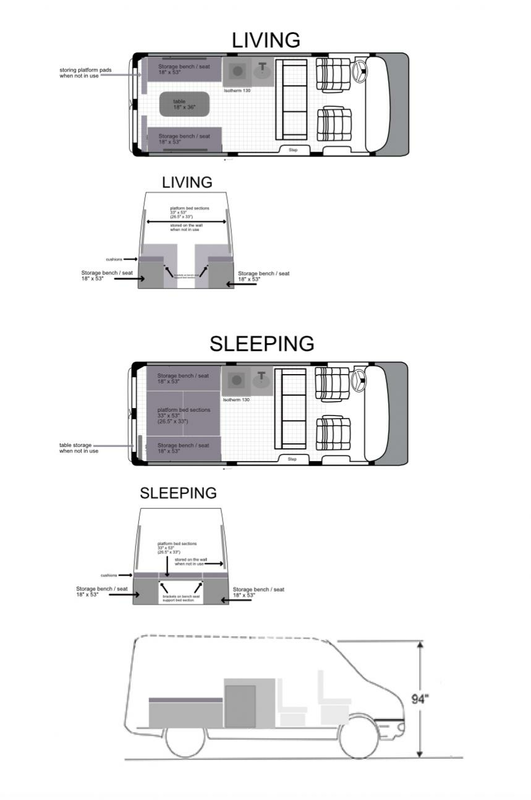 I was never intending to build a super comfy RV type van but more of a daily driver / gear hauler / something better than a tent or 4Runner for camping kinda van. Thanks for the input though it's always great to hear the perspectives of van owners! One modest storage option that doesn't add much length to the van is an Aluminess rear bumper and a couple deluxe storage boxes. They hold quite a bit although they are not cheap. I even have my bike racks on the top of them. They are great for all the things that making traveling and camping more enjoyable. Here are some of things I carry in mine - tool box, saw, axe, shovel, leveling blocks, electric cords, water hoses, extra water jug, 2 small camp chairs, small gas grill, tank chemicals, tank dumping supplies, a small tent that I use to save my campsite when we are driving the van during the day, tire inflator, door mat, hitch, bike tools and pump, beer/pop/water, etc.. This is just the stuff we use outside the van and all of this stuff we use on every single trip. jrobe, that was heavily considered but for close to $5k we're going to give it a go without the rear boxes and add them if needed. Those are actually one item I think we will for sure add sooner or later. What do you think about the bike rack on top of the boxes? I use a OneUp rack already but wasn't sure about having the bikes that high.. love to hear your thoughts. The Aluminess rack with a couple 1upUSA bike racks work very well. They block the rear windows some but I installed rear and side view cameras for driving so I don't mind blocking the window. I think the bikes stay cleaner when they are up higher and I use a fabric cover over the bikes some. This also allows use of the hitch although I need a 12" hitch extension with the deluxe boxes. Are you going to sleep widthwise in the van? You would have to be pretty short for that in a Sprinter. All times are GMT -6. The time now is 12:25 PM.